Simply, ductless AC systems (also known as mini-split systems) function in a very similar way to central AC systems just… minus the ductwork! Instead, they use thin copper tubing to pump refrigerant directly to discreet wall mounted blowers inside the home. This also means there’s no need for basement- or attic-located evaporator units. 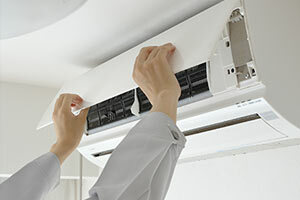 Ductless AC systems also function as heating systems during the winter months by absorbing heat from the air outside and moving it inside for convenient and energy-efficient year-round comfort. Best of all, unlike central AC, ductless A/C systems come in a range of capacities and configurations that can fit even the most challenging spaces. No ductwork installation means less hassle and more efficiency. Without ductwork you lose less than 5% cooling vs. up to 40% for traditional central AC systems, with increased efficiencies up to 27.2-SEER for lower utility bills. Unlike window units, ductless systems are mounted high on a wall, away from the window, for better home security, view and light. You can rely on our AC professionals to help you learn more about ductless AC and figure out which systems best suit your budget, as well as all your new ductless AC system installation needs. Contact us today!